That phase 4 looks beautiful. A bit of money thrown that way would have seen the Victors last as long as the US B-52's. The initial Victor B.2 featured a wing tip extension, and a plug between the fuselage and engines. This allowed the fitting of an APU in the starboard side. The cooling intake for the tail ECM suite fitted below the fuselage in the B.1A was subject to clogging with Window chaff, and so for the B.2 the air intake was repositioned to the base of the tail. Additional air intakes that would only open when required with low airflow were also installed in front of the tail. The initial production B.2 was demonstrated at the Farnborough Airshow, without painted serial numbers and curiously with the wing-walk areas painted black on the white anti-flash colour scheme. While production started, updates to the design were continuously worked on. The initial batch of aircraft left the factory with the blanked-off leading edge wing slats, but early in the production run the wing was changed to the final definitive drooped leading edge dogtooth. Last edited by Sheepster on January 12th, 2019, 6:19 am, edited 2 times in total. There is some disagreement over the model designations of the B.2, with the modification of the aircraft to accept the Blue Steel missile. The RAF did not issue a revised designation for the modification, and officially referred to all B.2 aircraft just as B.2's. With the modification process at the factory, HP referred to the upgraded aircraft as B.2R (for Retrofit) - but that was an inhouse notation at HP, and there is no evidence that it was used outside of the factory. Similarly a name of B.2BS (for Blue Steel) is also sometimes found in the literature, but was never an "official" name for the aircraft. So I have gone with the "Interim B.2" for the initial titling of the pre-modification aircraft, and just "B.2" for the modified aircraft. 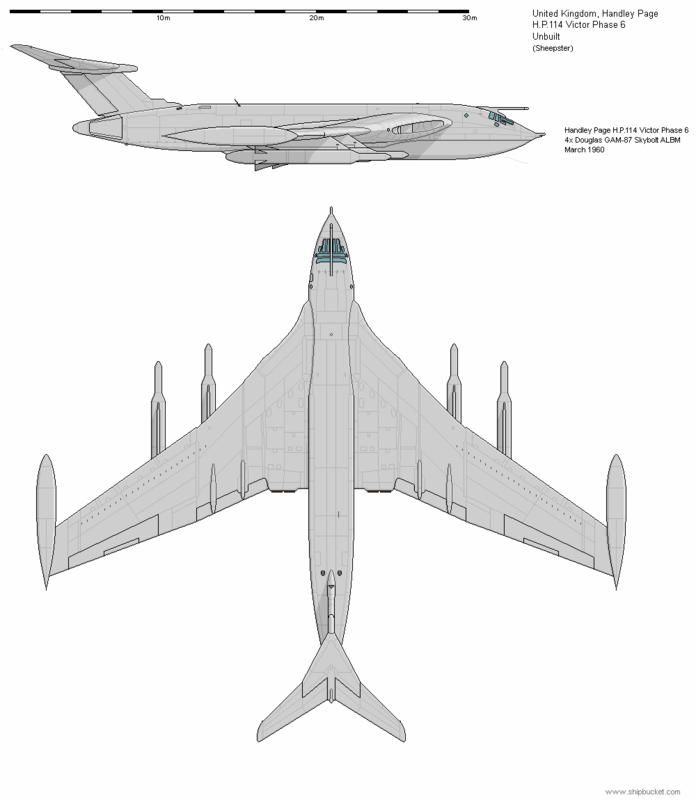 With the ongoing development of the Victor several modifications were simultaneous applied as the Victor B.2's were returned to the factory for upgrade to carry a single new Blue Steel nuclear missile. Even with the Victors' voluminous bomb bay the Blue Steel was required to be carried semi-recessed with it's tail fins folded for ground clearance. The modifications included a revised ECM package at the tail, which with the increased cooling needed for the electronics, required additional cooling fitted into the tail leading edge. The most distinctive feature was the addition of the "Kuchemann Carrots", the aerodynamic fittings on the wing. These served the dual purpose of significantly reducing trans-sonic drag and carrying the chaff dispensers. 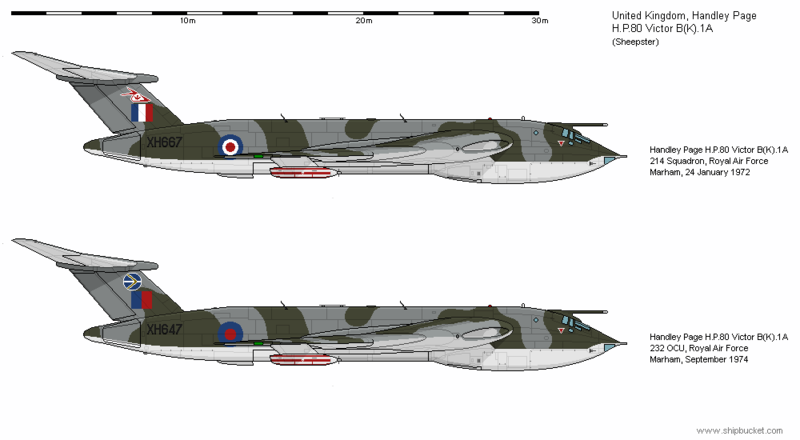 Initially the aircraft were delivered in anti-flash white, but with the realisation that Soviet defenses would decimate WWII-style high-level bombers, the Victors transitioned to a low-level strike role and adopted a camouflage colour scheme. The first aircraft to be coloured recieved a hybrid scheme, and all subsequent aircraft recieved what would be the standard colours. Fantastic work on all of these Victors! They are beautifully drawn. Following on from the Blue Steel upgrade, 9 interim B.2's were also upgraded to a similar standard for the strategic reconnaissance role to fill in with the retirement of the Valiant from the recon role. 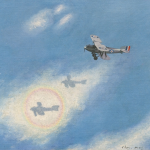 Initially the aircraft retained the ability to operate as bombers, and so were titled as B(SR).2, but with the dropping of multi-role ability the designation was changed to SR.2. The SR modification package differed from The BS upgrade by not including the Blue Steel missile specific features, and not including the ECM countermeasures package - determined not to be needed for high level recon. Like the Blue Steel aircraft, the SR.2 was able to be fitted with slipper drop tanks. The recon package consisted of additional cylindrical fuel tanks fitted for and aft in the bomb bay, with a photo pallet fitted between. This pallet contained the largest camera package ever operated by a Western air force. It was boasted that a single Victor could either photograph the whole of the UK in 2 hours, or the whole of the Mediterranean in a 7 hour sortie. Last edited by Sheepster on January 12th, 2019, 6:20 am, edited 2 times in total. While Britain was working on developing the Blue Steel ALBM, in America other ALBM missiles were also being developed. The British government decided to adopt the Skybolt, while still in development, for the V-bomber force as individual aircraft could carry multiple weapons. HP proposed two designs; a significantly modified aircraft able to carry 4 Skybolts, and a relatively simpler modification to carry 2 Skybolts. The 4 Skybolt variant was designated as the Victor Phase 6, while there is no (currently known) Victor Phase 5. 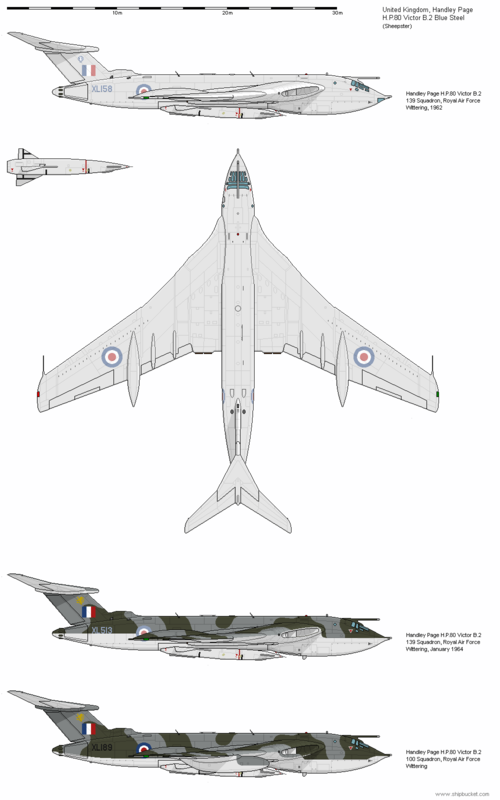 However the modification to Patrol Missile Bomber notes the 2 Skybolt aircraft as the Patrol Missile Bomber Phase I, with the 4 Skybolt aircraft as Patrol Missile Bomber Phase II - so perhaps the Victor Phase 5 was the 2 Skybolt aircraft? HP's proposal for the Skybolt was for initial aircraft to be modified by the addition of wingtip fuel tanks and mounts for Skybolts at the standard fuel slipper tank mountings. HP envisioned the modification being conducted in the field at RAF stations with supplied kits. The more significant upgrade would require more extensive work to be completed back at the factory, with the aircraft allocated the H.P.114 designation. Further additional fuel tankage was to be included with the complete replacement of the bomb bay with a conformal tank fitting, and the addition of pylons to mount the extra Skybolts. The increased weights would require a strengthened 12-tyre undercarriage. 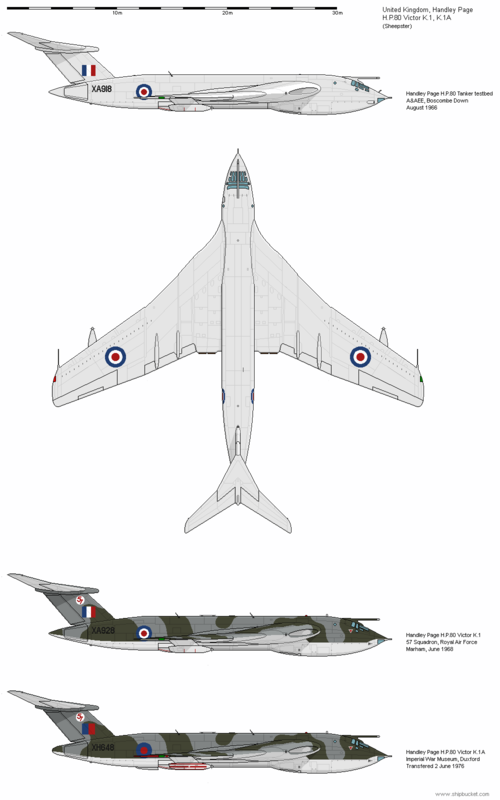 The ground clearance of the Skybolt under the Victor was a concern, and it appears that the RAF never seriously considered the Victor as a Skybolt platform. 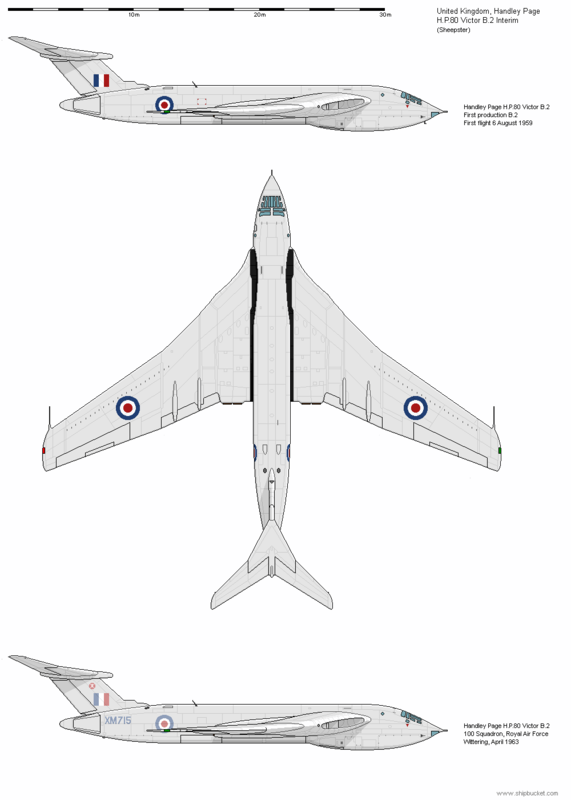 The Vulcan was eventually used for testing of the Skybolt, but the project never came to fruition, as in December 1962 the US cancelled the Skybolt. The Victor was never planned to become a tanker, but with the retirement of the Valiant tankers work commenced on reconfiguring the retiring Victor Mk.1's. As the fatigue issues facing the Valiant were seen to be leading to the Valiants being grounded earlier than expected the need for a replacement tanker became pressing, and so as an interim measure 6 aircraft were converted to become dual purpose bomber/tankers. The B(K).1A aircraft were modified to carry 2 inflight refueling pods, while still retaining their bomb bays and the ability to be reconfigured back to bomber duties. Once the more advanced tanker modifications were completed, the B(K).1A aircraft were relegated from front-line duties to become tanker training aircraft. 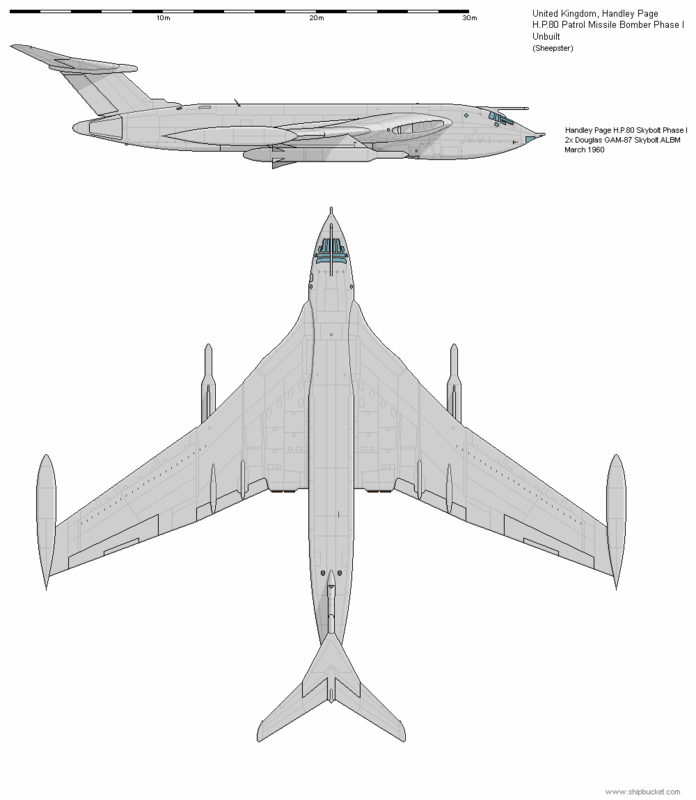 The definitive Mk.1 tanker conversion was a dedicated tanker, fitted with the 2 wing mounted fueling pods, and an additional hose and drum unit mounted in the former bomb bay, resulting in aircraft that were now tankers only. B.1 aircraft were modified to an almost B.1A status with the addition of the dog-tooth wing leading edge and the IFR probe. 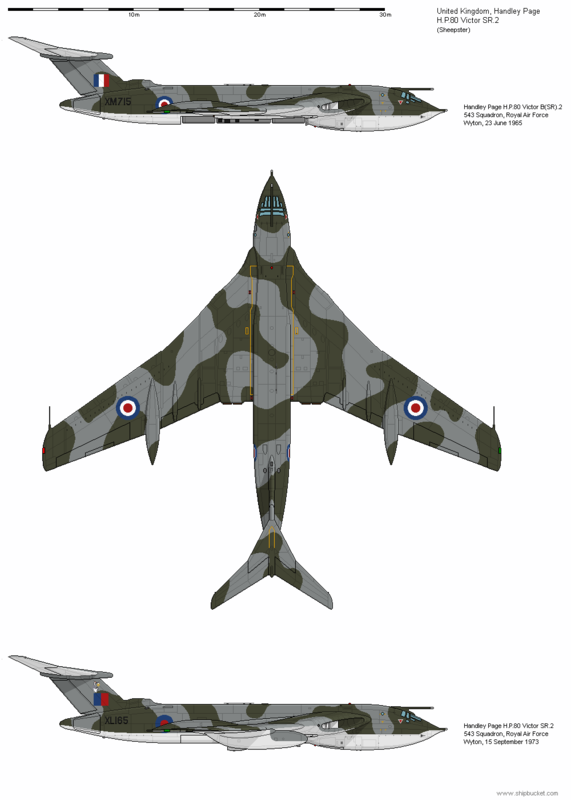 Work on tanker conversion was begun with the second production Victor, which had never seen RAF service. The K.1 and K.1A aircraft worked consistently until eventually replaced by the Mk.2 tanker conversions.